What is the usb on the go function. Does it make us able to use mouse, keyboard and usb. your e is coming on your screen because of constant internet connection which is automatically established by the phone. please check wether you have any email address registered in your phones mail application. if you have any application running which requires internet connection, please close it and restart your phone. I had purchased this phone a month back. I am facing two problems. 1) sometimes the battery drains overnight without even using the set. 2) I had activated What's app in My App and used it for a month with a DOCOMO Sim. Now I have replaced it with Airtel SIm and deactivated the settings. Then too E is continuously coming on the screen and my charges are being deducted. Has anyone connected Asha 302 to an Ad-hoc network? I want to share LAN connection via Ad-hoc using WLAN, but I cannot do this. Asha 302 does not show my Ad-hoc network in "Available Networks"
Hi there! I have bought this phone recently despite all the bad reviews here about battery life and all. As a Nokia fan - I own plenty of their models, so I could easily compare them based on my own experience. 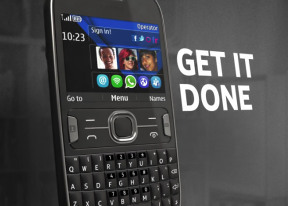 This Asha 302 seems to be an improvement of Nokia C3 and quite related to the E-series Qwerty style and these are stylish phones in the business branch but quite out of date these days. It's similar to Blackberry patent and it stands out in the Asha line as a very well-built mobile phone - it feels like an expensive one, by all means! I am very pleased with the concept - the grip is fine, the weight is perfectly ballanced - if you close your eyes it gives you the impression you are holding a smoother Ipod Classic, sixth generation. If you use this Asha to really talk a lot - you made a smart deal - the sound of the voice call is crisp and loud (voice clarity improvement) and the loudness of the ringtones is great for any busy environment, so don't worry - you won't miss any call! If you walk a lot in daylight - you will be really satisfied by the view angles of its display, it's the old school of Nokia style - the very best of it! At night - you can't complain about the lights or the display lit of this Asha - it stands out in the crowd. It's true this is far from super amoled type of display but the resolution of Asha 302 is acceptable and is actually higher than expected when you read its specs! The fact that it supports 32 Gb microsd cards helps a lot to pack your photo memories & a respectful range of Mp3s, as for me I now run a 16 Gb Verbatim card class 4 just fine - the 1 Gh processor works its magic and sometimes I wonder how could I stand all the middle class operating systems powered by Nokia for so long! All I'm trying to say is that Asha 302 is fast - as fast as you want the best phone to be - click and done - no time to waste - just like business line! The radio reception is perfect - in case you ever wanna catch up with the latest news and the audio level is fine when listening to mp3 files - I must admit - you should chose the apple earbuds to get the sound at its full, or even a higher Sony model in order to look cool! A good advice - this phone is not for playing games - stop this kiddo approach and grow up, don't lose youself in virtual reality, buy a Sony PSP VITA and get over with it - this Asha is for business type of owner or at least on a false pretence if you like... I've read all these nonsense about battery life! People stop misinforming - Asha 302 rules! It lasts at least 4 days with average use... If you are continuously connected with wi-fi or using whatsapp you will feel your phone dying in two days or so...but that is normal, so don't put a pressure on it 'cause you are an internet freak - this is a phone - a very good one! Adding up: don't worry about the precious themes - they are on their way - Asha 302 supports them but it's too new - that's the reason you can't dig for such goodies for free, just yet! the same thing with pdf apps or document viewer & the screen resolution favours you to simply shrink your photo albums and pack them along to show off just in case, big time! So pick a colour and have fun! I purchased this handset a week ago and at first I didn't know why the battery was draining so fast. So I decided to change the network mode from "Dual Mode" to "3G" and that was the end of my worries. It's now perfect!!!! will plz anybody help me hw to use watts appp!!!!!!! I purchsed a month ago. Very Good set. Beautiful in style and easy in use. I like fast 1 ghz processor..I hate the one thing that it has no multitasking..
why the data charge is still charged even i've connected to wifi ?? the H sign will be appeared on the screen then my credit will be vanished .. This is a great phone. The only bad thing is the battery. Actually my worst battery experience with a nokia phone. It drains even when you're doing nothing!!! very good handphone. If you addictive to texting via whatapp, sosial network is very easy. the most amazing function is internet call already made inside. no need to download for internet call. Sory for broken english.